...hike if I want to! Man, I never thought I'd say that in a million years..
For my birthday this year, I decided that I wanted to do something big. I knew that I wanted to do something to kick off the next year focusing on my goals. I decided to give myself the gift of fitness. Near where I live there is a mountain with a Y on it for the local college. That hike is kind of a big deal, so I decided for my birthday, that's what I was going to do. I was going to hike the Y even if it killed me! I also decided that this was something that I needed to do by myself. 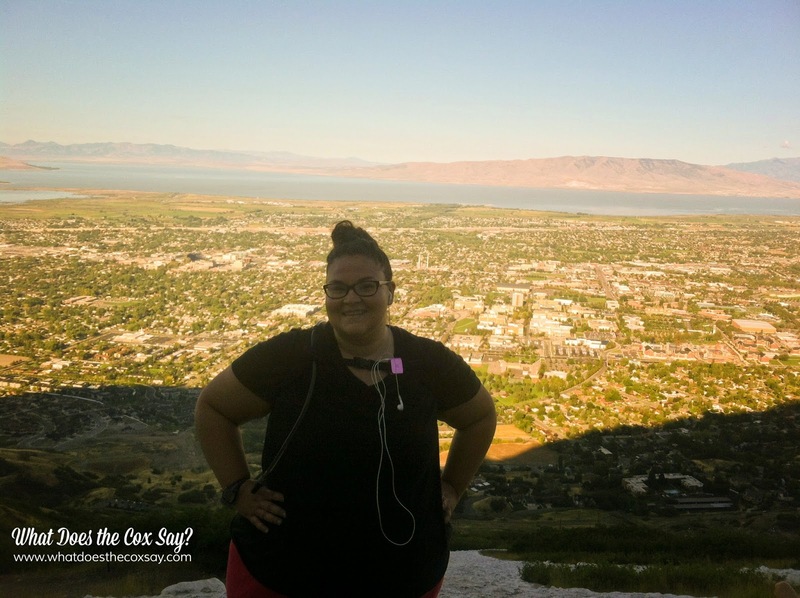 I knew that this hike was going to be symbolic of the journey that lay ahead of me with my weight loss, and though there will be those who support me along the way, ultimately it is something that I need to do on my own. The night before, I wrote out positive affirmations that I wanted to tell myself along the way and decided that I was going share them with others along the path. 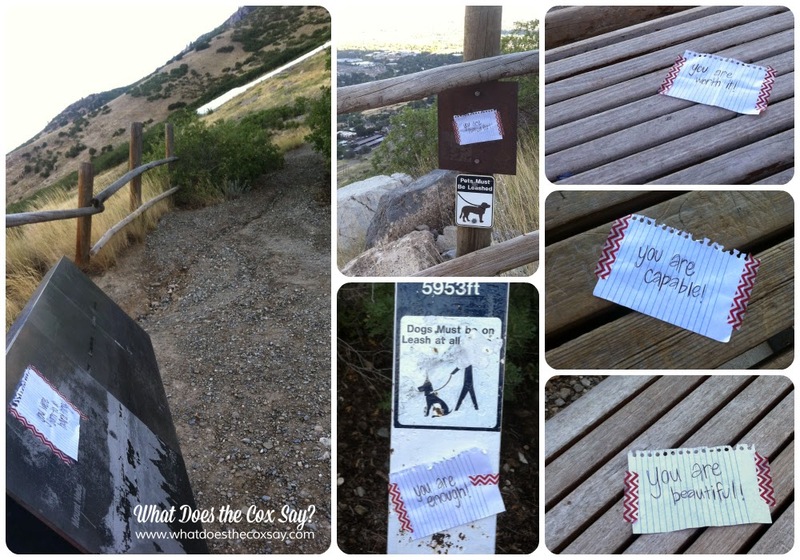 At each switchback I taped up one of my affirmations. It was so neat to see people stop and read them on their way up to the Y as I was on my way down. The affirmations included: You are rooted for, you are capable, you are beautiful, you are enough, you were born to do hard things and you are worth it. One thing that I loved about the hike was that most people out there were really friendly. As they passed by they would root me on or tell me how awesome I was doing. I knew that I would need a lot of breaks to get to the Y. I also know that on my weightloss journey I am going to need to take some breaks and THAT'S OK. I'm not talking about several day or week long breaks. I'm talking about a brief break for a meal or a day here and there to let me catch my breath or let me focus. What matters is that if I do take breaks I continue to work towards my goal and keep accountable for it instead of giving up. Breaks are OK! It's all about progress, NOT perfection. Once I reached the top I wanted to shout "I DID IT!" but I didn't want to freak anybody out. There's three different paths to reach the Y, one at the bottom, one in the middle, and one at the top. I chose the one at the top. I didn't want to get almost to the top of the Y, I wanted to conquer it, and I did! It's a fairly busy path. I saw a lot of wildlife. I saw a squirrel, a cotton tailed rabbit and I was pretty sure I was being stalked by a cougar. It turns out it was just a guy on the switchback behind me, he was hidden and all I could hear was his breathing. It got my heart rate up quite a bit which was ok with me! That means more calories burned...BOOM! The best thing that happened to me while at Fitness Ridge is that I ran out of excuses. I kept saying that I wanted to hike the Y when I was more fit. Well, I learned there that I can do anything I put my mind to. I may huff and puff along the way and make other people think they're being stalked by a cougar. 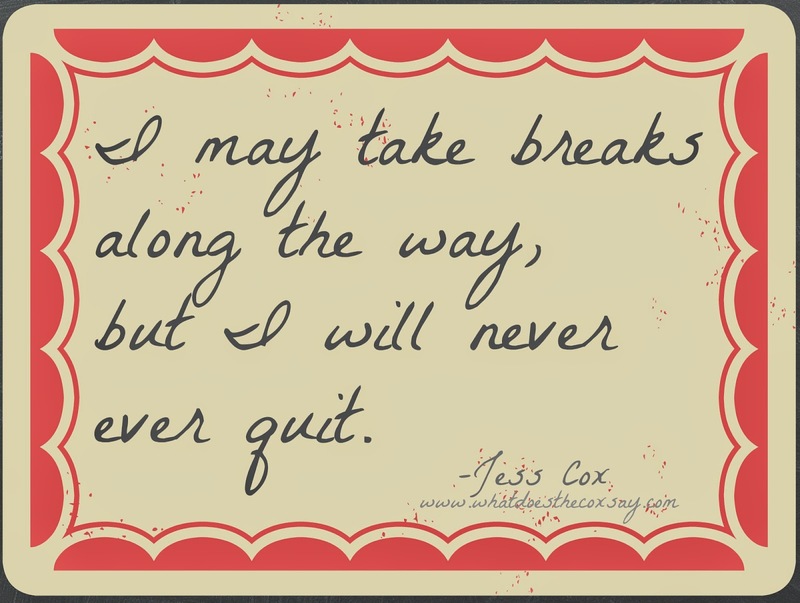 I may have to take some breaks to catch my breath and refocus myself, but at the end of the day I know I can do it. Set your excuses to the side my friends, you were born to do hard things! Thank you for sharing your experience! You are amazing! I love that you put them on the signs for others to see! You are amazing. Your signs of affirmation were an awesome idea. And, by the way, I'm glad to know I'm not the only one with some kind of cougar phobia climbing that mountain! I feel your fear! ;) Good job, Jess!